The bagel was made for cream cheese or maybe vice versa. Nevertheless, it’s hard to imagine one without the other. But bakers do. You’ll find a delicious assortment of bagels at shops throughout the state in unique flavor combinations, as well as inventive ways to make bagels into more than just a breakfast treat. Here are the nine best bagel shops in New Mexico! A great bagel has a crusty exterior and a soft, chewy interior and a crunch when you bite into it. That’s the kind of bagel you’ll find here. Try one with the house-made green chile cream cheese and it’ll be a regular stop off I40. They use only organic and locally-sourced ingredients and bake artisanal bread and bagels daily. Housed in what was once and old warehouse and art studio, stop by this friendly hang-out for a cup of direct trade coffee and any one of their signature bagels five days a week. Look for the vintage Silver Stallion Saloon sign. Although this is more than just a place for bagels, the ones they make are extraordinary. Baked fresh every day in the Cornerstone ovens, the bagels toast up perfectly and have just the right amount of crispy exterior and soft, doughy interior. Try the Bonito Rive breakfast sandwich with scrambled eggs and Canadian bacon topped with cheddar cheese piled next to pan-fried potatoes. Morning comfort food at its best. This high-mountain bakery even serves up a delicious bagel, cream cheese and lox option—you don’t see that in every mountain town! The “best bagels above sea level” is what their sign claims and the bagels have lived up to that claim—for more than 20 years. Baked daily, in-house, from scratch with fresh ingredients and no preservatives makes these bagels delicious. Choose from a selection of 28 different varieties with flavors like sun dried tomato, jalapeno cheddar, Swiss cracked pepper and, of course, green chile. The tasty schmears include spinach artichoke, chipotle, honey cinnamon and green chile. Just imagine a green chile bagel with green chile schmear—the stuff that dreams are made of! Here you’ll find New York-style bagels which means you’ll get a puffy bagel with a moist crust that’s accented with the taste of salt and malt, added during the dough-making process. Which also means you’ll get a traditional breakfast bread that’s really yummy. Bagels are made on-site, daily. The everything, green chile bagel with eggs, bacon, ham or sausage and cheese is an incredible kick-start to the day. This is a locally owned and operated shop with a commitment to the community and to making customer satisfaction it’s number one priority. 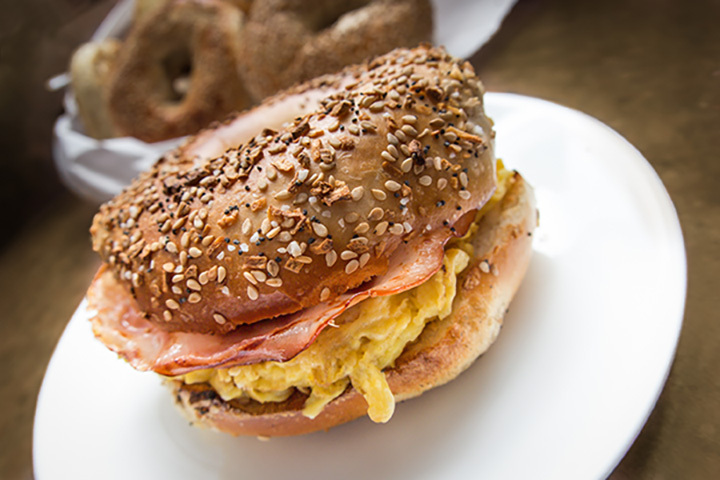 Stop in for a breakfast bagel and then take a bag home so you can have bagels for lunch and dinner and maybe even breakfast the next morning … they’re that good. Bagels are made in the traditional New York-style from family recipes, from an original New York-er, that have been passed down for generations. Try the Deluxe Nova Scotia Salmon Sandwich on a pumpernickel bagel: salmon, tomato, onions, cucumber, sprouts, Kalamata olives, capers and any kind of cream cheese. Gluten free options available. A great place to sit outside, weather permitting. Here’s a place that makes such yummy bagels you’ll have to eat the whole thing. That’s what owner Ruby K says about her shop, and it’s true. All bagels are prepared from-scratch and baked on-site daily. Bagels are served as a breakfast item as well as on the sandwich lunch menu. Choose from a variety of two dozen different bagels that run the gamut from sweet to savory. Try a green chile and green chile cheddar if you’re in the mood for southwestern flavor. Also on the menu are bagel dogs and home-made bagel chips. Gluten free options available. Yes, there’s great direct-trade coffee here which is a wonderful complement to the top-notch bagels they have here, too. Bagels are made on-site in what’s considered the Mon-treal style, more like a croissant than the traditional New York crunchy on the outside, soft on the inside style. An upscale, hip cafe with a roomy back patio that’s a perfect setting for a moment with their green chile parmesan bagel and a made-to-order cup of coffee. With locations scattered around town, a bagel is always within grasp! As is a cup of cof-fee to go with it. Their motto is “Breakfast in Bread” and their bagels support that. From the nine-grain to the roasted green chile cheddar to the everything, these bagels will make you happy that you got up. Slather with cream cheese and organic jam and the day might just be complete from the get-go. It’s locally-owned and operated and has a commitment to organic and sustainable practices. This full-service, natural food supermarket has been a prominent member of the Taos community for more than 30 years. They offer a huge selection of natural, organic and natural products including fresh bagels in their baked goods section. There’s enough selection in this store to create a gourmet breakfast with a bagel as the base. Add some hummus or tapenade or organic cream cheese, all which can be purchased right here. Take your picnic fare outside to their glassed-walled patio and enjoy the view or on a hike in the nearby mountains. Great customer service and friendly atmosphere.